The Lottery has been drawn for this week. kathyjuly is the winner of the 82,100MP Jackpot with the winning numbers of 1, 9, 2, 7, 4 and 3! Congratulations! Last Week's Raffle has now ended. bjababy is the winner of the Red DNA and 100,000MP prize with the winning raffle ticket number 3358! Congratulations! Make sure you buy your tickets for today's raffle - only 10MP per ticket! The Lottery has been drawn for this week. Meghan15x is the winner of the 73,400MP Jackpot with the winning numbers of 5, 19, 21, 17, 9 and 24! Congratulations! Last Week's Raffle has now ended. PacWoman92 is the winner of the Red DNA and 100,000MP prize with the winning raffle ticket number 1919! Congratulations! Make sure you buy your tickets for today's raffle - only 10MP per ticket! The Game of the Week has now changed to Uno. A new Gnome Account Upgrade has just been released. You will receive a gnome themed cd, book, dvd, potato, costume, stamp, minipet and either a genie coloured Lati or Murfin Potion. The Lati pet will never be avaliable in any Account Upgrades again. Do you have a Mad Scientist Pet? All Mad Scientist costumed pets will receive FREE training for a month at the Gym and School. Free training ends until September 24th. You can now collect Income from your pet's job. American Costumes have been retired. These new Hidden Avatars are avaliable for you to find. 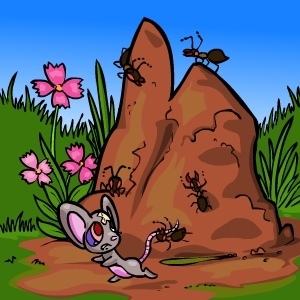 The Ant Hill has just been released in Gigantic Paradise. It has long been known that ants live in huge colonies under the soils of Marada, with the biggest, deadliest ants living under Gigantic Paradise. They have lots of value of items stored inside that they hoard for themselves. If you are brave enough, you can try and steal some items from them. You can only try once a day. The July 2011 Monthly Checklist winners have been announced and the prizes have been rewarded. Congratulations to all of those who have won. Don't forget, this is a monthly permanent feature that you can enter for FREE. If you haven't already, you should enter the August event! The Lottery has been drawn for this week. DarkheartKindsoul is the winner of the 84,800MP Jackpot with the winning numbers of 23, 12, 24, 13, 20 and 11! Congratulations! Last Week's Raffle has now ended. AnimeGirl247 is the winner of the Red DNA and 100,000MP prize with the winning raffle ticket number 1887! Congratulations! Make sure you buy your tickets for today's raffle - only 10MP per ticket! The Game of the Week has now changed to Whack an Azul. The Lottery has been drawn for this week. Blizzardfail is the winner of the 136,100MP Jackpot with the winning numbers of 16, 4, 23, 15, 8 and 10! Congratulations! Last Week's Raffle has now ended. sineadstar is the winner of the Red DNA and 100,000MP prize with the winning raffle ticket number 6504! Congratulations! Make sure you buy your tickets for today's raffle - only 10MP per ticket! The Game of the Week has now changed to Addow Ride. The Lottery has been drawn for this week. mta1999 is the winner of the 83,700MP Jackpot with the winning numbers of 15, 16, 24, 11, 9 and 25! Congratulations! Last Week's Raffle has now ended. littleshadowboo is the winner of the Red DNA and 100,000MP prize with the winning raffle ticket number 2082! Congratulations! Make sure you buy your tickets for today's raffle - only 10MP per ticket! The Lottery has been drawn for this week. FullOfWin is the winner of the 109,200MP Jackpot with the winning numbers of 12, 6, 17, 10, 7 and 14! Congratulations! Last Week's Raffle has now ended. AnimeGirl247 is the winner of the Red DNA and 100,000MP prize with the winning raffle ticket number 1298! Congratulations! Make sure you buy your tickets for today's raffle - only 10MP per ticket! The Game of the Week has now changed to Rofling Gold. The Lottery has been drawn for this week. fridgeraider is the winner of the 113,600MP Jackpot with the winning numbers of 1, 6, 13, 18, 22 and 24! Congratulations! Last Week's Raffle has now ended. Lanile303 is the winner of the Red DNA and 100,000MP prize with the winning raffle ticket number 5189! Congratulations! Make sure you buy your tickets for today's raffle - only 10MP per ticket! The Lottery has been drawn for this week. ktlou1989 is the winner of the 101,300MP Jackpot with the winning numbers of 1, 3, 22, 21, 10 and 15! Congratulations! Last Week's Raffle has now ended. pokeboy46 is the winner of the Red DNA and 100,000MP prize with the winning raffle ticket number 7808! Congratulations! Make sure you buy your tickets for today's raffle - only 10MP per ticket! The Lottery has been drawn for this week. jjd0405 is the winner of the 118,600MP Jackpot with the winning numbers of 5, 16, 4, 6, 24 and 14! Congratulations! Last Week's Raffle has now ended. MassPanic is the winner of the Red DNA and 100,000MP prize with the winning raffle ticket number 7332! Congratulations! Make sure you buy your tickets for today's raffle - only 10MP per ticket! The Lottery has been drawn for this week. MinutenSteak is the winner of the 124,500MP Jackpot with the winning numbers of 4, 2, 21, 1, 16 and 5! Congratulations! Last Week's Raffle has now ended. princezica is the winner of the Red DNA and 100,000MP prize with the winning raffle ticket number 2695! Congratulations! Make sure you buy your tickets for today's raffle - only 10MP per ticket! The Game of the Week has now changed to Klondike Solitaire. A new American Costume has just been released in time for the 4th of July. You may randomly receive one after any Quest you complete or any item you Restock from now until July 8th. Good luck!!! The Lottery has been drawn for this week. juicyjuicebox is the winner of the 106,100MP Jackpot with the winning numbers of 8, 9, 18, 7, 3 and 5! Congratulations! Last Week's Raffle has now ended. WestlifesNo1Fan is the winner of the Red DNA and 100,000MP prize with the winning raffle ticket number 2047! Congratulations! Make sure you buy your tickets for today's raffle - only 10MP per ticket! The Lottery has been drawn for this week. UltraFlyingPanda is the winner of the 108,800MP Jackpot with the winning numbers of 12, 8, 19, 23, 16 and 7! Congratulations! Last Week's Raffle has now ended. wchaguy is the winner of the Red DNA and 100,000MP prize with the winning raffle ticket number 1467! Congratulations! Make sure you buy your tickets for today's raffle - only 10MP per ticket! The Game of the Week has now changed to Murfin Chase. These 5 pets can now wear the Digital Costume. Rapunzel has been busy lately and has 20 new items on sale in her tower! These 5 pets can now wear the Genie Costume. The Lottery has been drawn for this week. dxw95 is the winner of the 148,500MP Jackpot with the winning numbers of 8, 2, 16, 21, 5 and 4! Congratulations! Last Week's Raffle has now ended. jrenna is the winner of the Red DNA and 100,000MP prize with the winning raffle ticket number 2173! Congratulations! Make sure you buy your tickets for today's raffle - only 10MP per ticket! The new Stone Costume is on sale at the Pirate Ship for a One Thousand Dukka Coin. These 5 pets can now wear the Mad Scientist Costume. The Lottery has been drawn for this week. Kats2005 is the winner of the 95,800MP Jackpot with the winning numbers of 25, 15, 6, 10, 20 and 5! Congratulations! Last Week's Raffle has now ended. BloodpakDave is the winner of the Red DNA and 100,000MP prize with the winning raffle ticket number 1455! Congratulations! Make sure you buy your tickets for today's raffle - only 10MP per ticket! The Game of the Week has now changed to Newth Snowboarding.